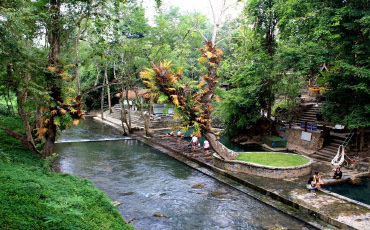 The shaded, scenic location of Hin Dat Hot Spring offers the opportunity to relax, have fun and be good to yourself all at the same time! The site comprises two large hot pools alongside a natural stream where you can cool off in between sessions. Changing rooms, showers and refreshments are also on site, plus there are plenty of quiet picnic spots further upstream. For those seeking the complete natural spa experience you can take advantage of the tasteful on-site massage area too! 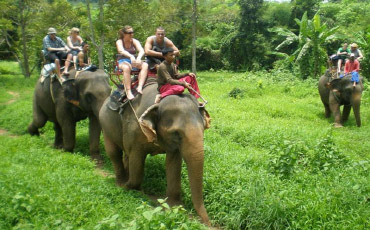 The countryside in Kanchanaburi lends itself perfectly to elephant riding and the province is rightly known as a premier spot to ride and feed these awesome animals in natural surroundings. Don't miss out on the chance of a lifetime! 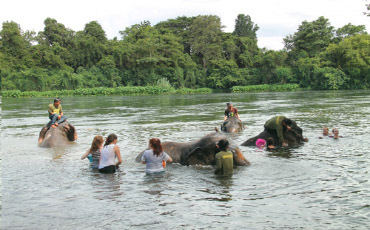 In addition to riding, you have the option of bathing elephants too (see the information listed below). Join in the riverside fun as you witness the brilliant spectacle of elephants at play. You will also get the chance to help these marvellous animals in the important job of keeping clean and cooling off from the tropical heat, plus you can take a dip yourself at the same time. Getting wet has never been so much fun! 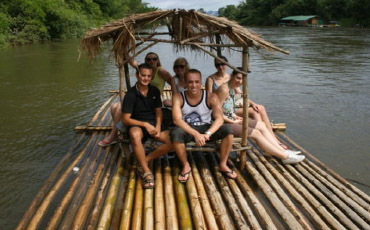 The most relaxing way to appreciate the stunning River Kwai Noi valley is to take a slow, gliding trip along the river itself on board a bamboo raft. Swim alongside the raft or simply sit back and enjoy the lush scenery as you follow the meandering path downstream. Long tail boats are also available for a faster trip in either direction. Life jackets are provided as standard. If you’re planning to visit just one Kanchanaburi museum relating to the Death Railway then this is by far the most professional and authoritative. It utilizes maps, models, original artifacts and previously unpublished photos in conjunction with well-written accounts of the history of the railway to bring the infamous story alive. Extra features include a research room, cafe/coffee shop and souvenir shop featuring local handicrafts. 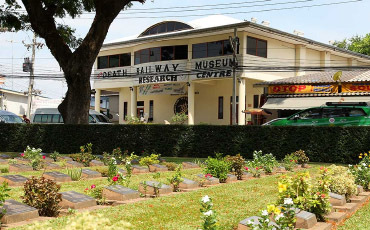 The Railway Centre overlooks Kanchanaburi War Cemetery, a beautifully-kept monument to the brave efforts of the POW’s who built the Death Railway. Name and military insignia are recorded on the small burial plaques which run throughout the cemetery, while shaded corners allow peaceful contemplation of the great losses suffered. 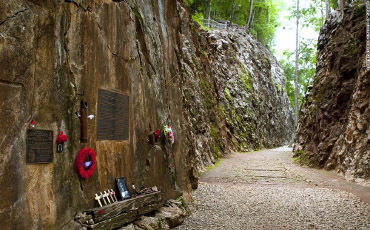 This is a memorial to the allied POW's and Asian labourers who died in the construction of the "Death Railway" during the Second World War. It comprises a fascinating museum and a 4 km. walking trail which follows the original path of the railway. The museum provides a clear, well-written account of the history of the railway and places it in the context of the Asia-Pacific conflict. The trail features many points of interest, notably the infamous Hellfire Pass itself, a cutting which was formed by slicing through rock by hand. Overall, the memorial is both an informative and moving testament to those who suffered so much in this region. It is advisable to bring walking shoes and drinking water. 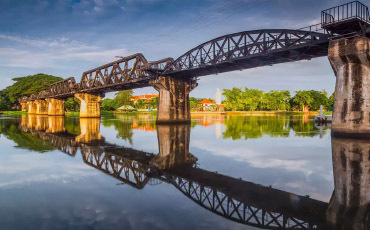 "Bridge on the River Kwai Located in Tambon Makham, Muang District, Kanchanaburi. It is one of the most important historical sites. The most important bridge of the Death Railway was built during World War II. 2 by the Japanese Army has taken the prisoners of war camp. Coalition includes About 61,700 British, American, Australian, Dutch and New Zealand troops, and Chinese, Chinese, Malaysian, Malay, Malay, Thai, Burmese, Indian, and many more. To build a strategic railroad As a route to Burma, where a certain route will have to cross the Kwai Yai River, a bridge must be built. Building bridges and railways. Full of hardships The cruelty of war and disease As well as lack of food Tens of thousands of prisoners of war have died. 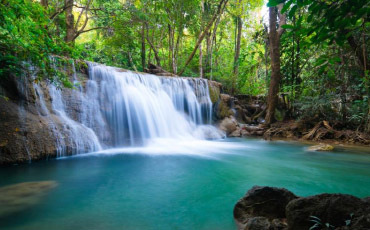 Kanchanaburi province is blessed with awesome limestone caves, and Lawa Cave (in the south-west of Sai Yok National Park) is one of the most impressive. 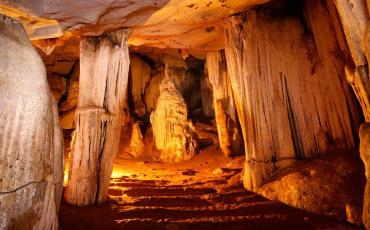 Subtly-lit and containing many incredible rock formations, this attraction reveals yet another side to the region's beauty. The cave's wonderful location, accessible by either road or river, makes the journey to and from the site a special experience too. 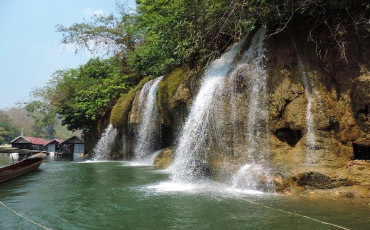 The special feature of this waterfall is that it gushes directly in to the River Kwai, making a picture-post card view worthy of this scenic National Park. 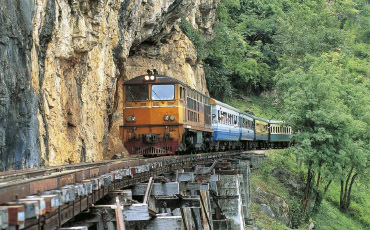 Limestone caves, remnants of the Death Railway, and numerous hiking trails through lush vegetation are also on offer in the Park, which lies adjacent to the border with Myanmar. The relatively isolated location means that some areas of the site allow visitors to spot stunning wildlife-maybe even an elephant if you're really lucky!